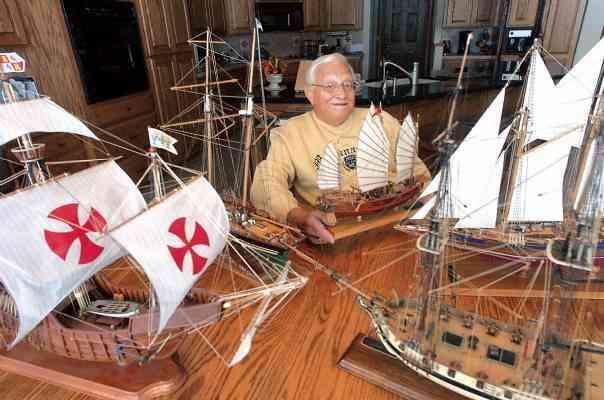 Bob Persichitte poses for a photo surrounded by some of the many model ships he has built through the years Dec. 5 in Loveland. LOVELAND (AP) - When it comes to building model ships, it's all about details. From tiny sails to cabins to cannons, these replicas aim to re-create everything that would be found on a full-sized vessel - only at a fraction of the size. And these models don't come easily; with the great detail comes a great deal of patience. But for Loveland's Bob Persichitte, the challenge is just about his favorite part of the hobby. "I set my mind-frame on what I want to get done, and I make sure what I'm doing is done right," he said. "It can get aggravating, but that's part of the fun." For more than 30 years, Persichitte has been creating intricate model ships. Sometimes he uses a model kit and other times just his imagination - but the 77-year-old always uses his hands and his patience to make the detailed works of art. It's a hobby Persichitte started after visiting the Naval Academy, where a model of the ship Fair American caught his eye. "It was so beautiful," he remembered. Persichitte, a coordinating engineer, already had been making model trains, planes and automobiles - why not try building ships, he thought. And the first model he chose to build was a replica of the ship that inspired him - the Fair American, a Revolutionary War brig. Like every model ship he's built since, the process starts by creating the hull, the body of the vessel. For his first model, Persichitte carved the hull from a solid block of wood. For other models, he's used strips of soaked wood that are bent to create the sides of the hull, held in place with miniature nails. Later come the masts, which stream seemingly hundreds of thin ropes around the ship - each knot hand-tied by Persichitte himself. "I've always wanted to do things with my hands," he said - and in this hobby, almost every aspect is built with them. Other details, such as the lifeboats and cannons found on deck, are created and painted by Persichitte before they're placed in the perfect spot. Some of these items are less than an inch long, like a tiny telescope that sits peering off the deck of one of the models. The intricate details often can be frustrating to make, Persichitte acknowledged. So to cope, he sets tiny goals along the way, creating miniature victories with each completed step. And while he always looks forward to the finishing touches, such as painting the outside of the ship, Persichitte knows every detail counts. Sometimes he completely remakes a part of the ship if it's not just right. "I like to finish the work, but it's what's underneath that makes a difference in how it turns out," he said. Because of this great attention to detail, Persichitte needs between 200 and 300 hours to complete each ship. And his commitment to patience pays off. Each finished ship looks as if it really was once a giant vessel that somehow was shrunken to the 1-foot models displayed around the Persichitte home. Through the three decades Persichitte has built ships, he has completed 13 and is working on his 14th. The models include historic flag ships from around the world. They are an amazement to anyone who sees them, said his wife, Elaine. But Persichitte would never consider selling them. "I have no idea what value they would be," he said. "You figure all the work and time you put in, why sell it?"